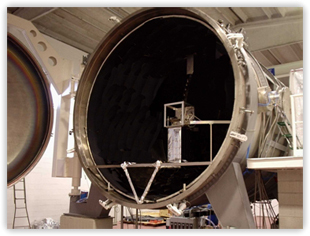 The large vacuum test facility - "LVTF - 1"
The large Vacuum Test Facility (LVTF-1) consists of a horizontal stainless steel cylinder with two full diameter end caps, which can be removed to allow the introduction of large test articles. 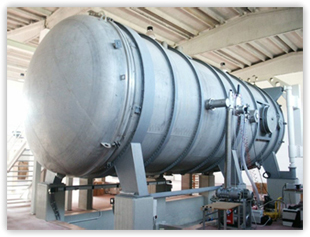 The chamber is 11.5 m long and has a diameter of 3.8 m for a total volume of 120 cu.m. On the side of the chamber there are three 900 mm diameter flanges which allow connecting through gate valves up to three service chambers for parallel tests of several articles.